I read this article and found it very interesting, thought it might be something for you. The article is called Naxal-Related Violence Has Killed Over 5,000 In 6 Years and is located at https://archive.indiaspend.com/sectors/naxal-related-violence-has-killed-over-5000-in-6-years-96216. India’s Union Rural Development Minister Jairam Ramesh recently said a new land acquisition Bill will help in tackling left-wing extremists (also known as Naxals or militant communist groups declared as terrorist organisations by the Union of India) as the movement is largely associated with land and forest rights. According to him, encroachment of land by corporations – both private and public – leads to marginalisation of tribals, which is a big issue for Naxals that helps them win local support. Will the land acquisition bill or steps like this help mitigate the violence? Its possible but too early to say. It’s also not clear whether all the other steps taken so far like negotiations, backward region grant fund to central forces offensive have actually delivered. Because the numbers show that people are still dying almost at the same rate as before. We looked at the state-wise extent of conflicts and the number of civilians, security personnel and Naxals killed during the last 6 years… and found that while around 3,000 civilians were killed in the violence, more than 1,000 security personnel and around 900 Naxals have been killed. The total casualty is 5,235 in 6 years, which turns out to be around 2 killings per day. The total number of Naxal-related violent incidents during the last 6 years was 10,568 where 4,027 people were killed, which roughly translates into 1 person being killed for 2.6 incidents. 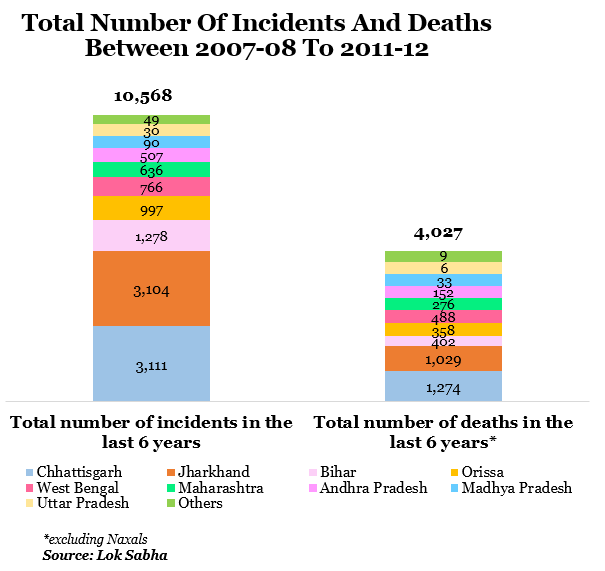 Chhattisgarh had the highest number of incidents and casualties followed by Jharkhand. Incidentally, out of 640 districts in India, around 87 districts (13.5%) faced Naxal violence. While 22 of them are in Jharkhand, 15 are in Chhattisgarh. Approximately 518 incidents took place, on an average every year, in Chhattisgarh with 212 killings while 517 incidents occurred in Jharkhand with 171 killings. Madhya Pradesh and Uttar Pradesh had the lowest incidences and casualties but they have only 1 district each affected by Naxal violence. 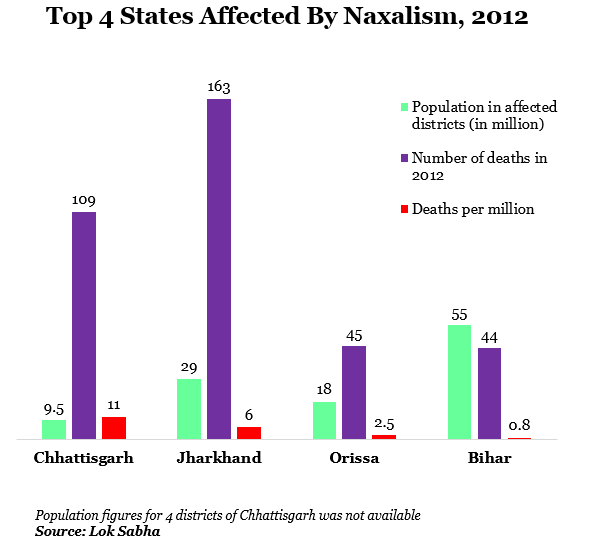 While Chhattisgarh had the lowest number of people living in Naxal-affected areas, it had the highest number of deaths per million. 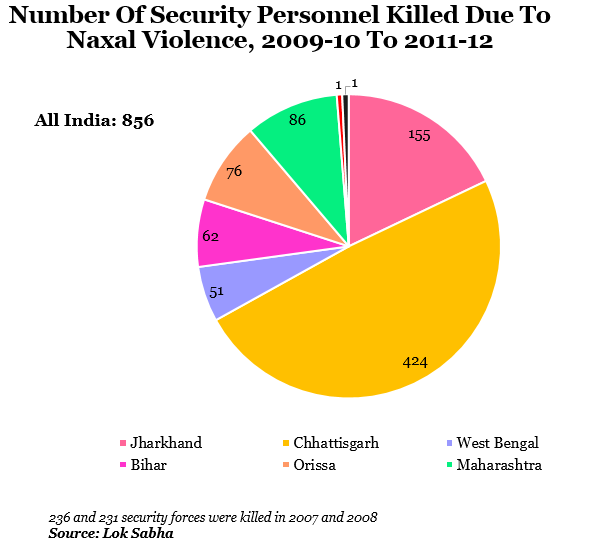 Bihar, which has the highest number of people living under Naxal zone, had the lowest death per million. 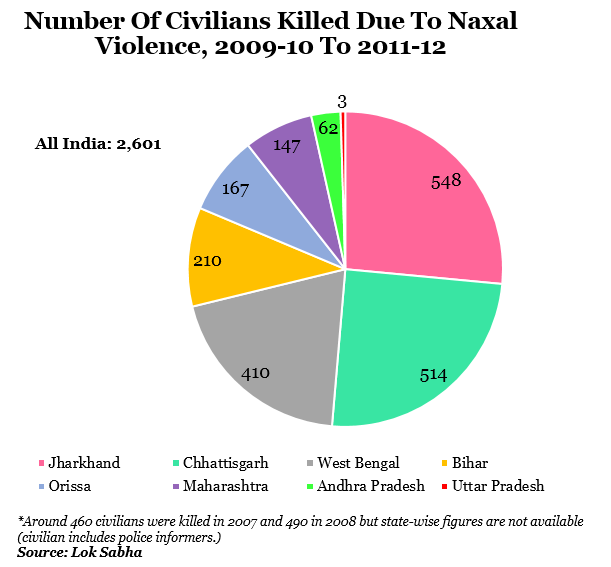 Around 3,011 civilians and 1,323 security forces were killed in Naxal violence from 2007-2012, which means around 4,334 lives were lost due to Naxal incidents. Incidentally, from 2008 to 2010, around 892 police informers were also killed. Jharkhand, with 548 casualties, had the highest number of civilians killed while Chhattisgarh had the highest number of security personnel killed with 424 casualties. Incidentally, in Figure 1, we saw that around 4,027 people were killed in Naxal violence while the above table adds upto 4,334 people killed. The discrepancy, if so, is could be because of some data variation between the first table sourced from a Parliament question on November 2011 and the second one sourced from a Parliament question on November 2012. So how many Naxals were arrested and killed during 2009-2012? Around 11,597 Naxals were arrested from 2007 to 2012 and around 901 were killed. 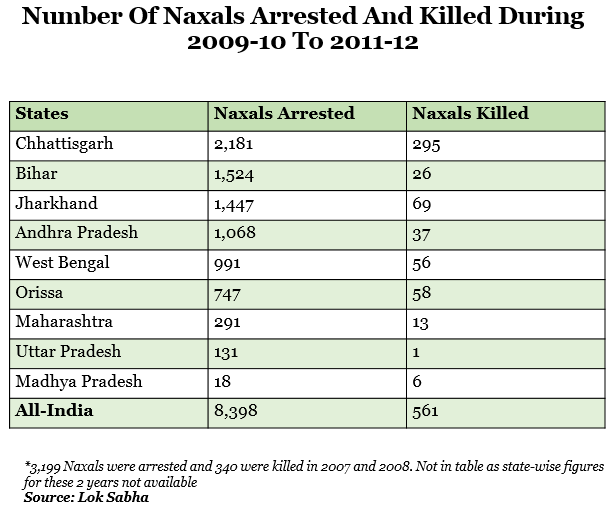 Chhattisgarh had the highest number of arrests and the highest number of Naxals killed. Madhya Pradesh had the least arrests and Uttar Pradesh had the least number killed. Incidentally, states like Karnataka and Tamil Nadu had 38 and 39 Naxals arrested around this time. And there were even 31 Naxals arrested in Haryana in 2009 ! *Around 507 attacks took place on forest roads/culverts followed by 201 on school buildings and 197 on Railways. Essar Group’s pipelines in Orissa and Chhattisgarh were attacked nearly 10 times. 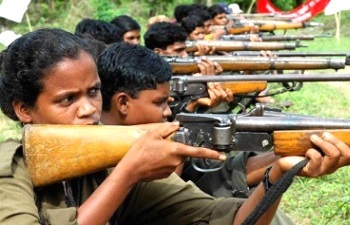 *1,963 arms were snatched by the Naxals and 329 arms training camps were organised by the Naxals. So, it is evident that 2009 and 2010 were the heydays of Naxal activities, which was subdued in the next two years. Interestingly, a few developments in 2013, like the killing of Congress leaders in Chhattisgarh, indicate the resurgence of the movement. So, will the new land Bill help tackle Naxalism and similar discontent or abuse of land rights ? The intention might be good but it’s not clear at this point whether it will help in scaling back the violence.